Here’s a great way for you to save even more money when you switch to Mansfield: Become a Mansfield Rewards Customer. It’s easy to enroll, with no annoying sign up, enrollment, or cancellation fees. And from then on, you don’t have to think about it. 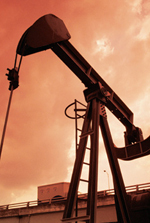 You just earn your rewards and we deliver your oil – automatically! Here’s how the Mansfield Rewards Program works. 1. You switch to Mansfield and enroll in the Rewards Program. * Just call us at 609-298-0617 or 856-456-0894, or email us at info@mansfieldcomfort.com , with your phone number for a call-back. First, call us to switch your home heating oil account to Mansfield and enroll in the Mansfield Rewards Program, providing us with your credit card information to use for billing. From the date you enroll until the end of the program (3/31/11), you earn a $1 per gallon credit on 18% of the gallons you get delivered. You don’t have to wait until the end of the entire program to get your credits for free oil; the credits you earn in each period shown above are posted to your account by the 15th of the month following the end of that period. You only need to enroll in the program once, and once you’ve enrolled, you don’t have to think about it again. We take care of everything, from oil delivery through crediting your account for all the credits you’ve received. Excellent savings for you and your family… automatically. That’s the Mansfield Rewards Program. It’s our way of saying thanks to you for becoming a Mansfield automatic delivery customer. Suppose you switch to Mansfield and enroll at the beginning of the program’s first credit-earning period, on 10/1/09. And let’s say that during that first period, from 10/1/09 through 3/31/10, you buy 1,000 gallons of oil. 18% of that 1,000 gallons is 180 gallons. The Mansfield Rewards Program credits you $1 per gallon for each of those 180 gallons. So you get a credit for $180 of free oil! It will be credited to your account by the 15th of the next month - by 4/15/10. Here’s another example. Let’s say that you switch to Mansfield and enroll almost halfway through the second credit-earning period, on 6/8/10. Between then and the end of the period, 9/30/10, you buy 300 gallons of oil. 18% of that is 54 gallons. At $1 per gallon, you get a credit for $54 of free oil! It will be credited to your account by the 15th of the next month - by 10/15/10. Don’t miss out! Call today to enroll in the Mansfield Rewards Program. There’s absolutely no minimum or maximum purchase of gallons required. But as you can see from the above examples, the sooner you enroll, the better for you – the bigger your free-oil credit will be. Call today. Enroll in the Mansfield Rewards Program today! Call 609-298-0617 or 856-456-0894 for full information. The Mansfield Rewards Program automatically delivers great savings for you and your family. But there’s a lot more to Mansfield. Just take a look at all the other services we offer. You can find them here. Our expert service technicians can keep your heating system (and air conditioner and water heater, too) running in top condition, so you’re not only earning savings with the Mansfield Rewards Program, but also running as efficiently – and economically – as possible, too. They can save you a bundle! 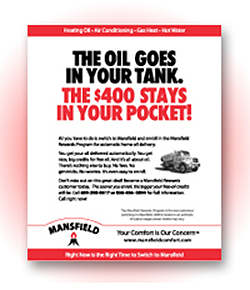 *The Mansfield Rewards Program is limited to residential Mansfield customers getting automatic oil delivery using a credit card on file with Mansfield. **The $400 credit shown in the accompanying ad is based on an estimate on typical usage. Actual credits may varies.